Sometimes you only have a short time to make a big impression. How do you do that? A 1-page website (or your website homepage)! 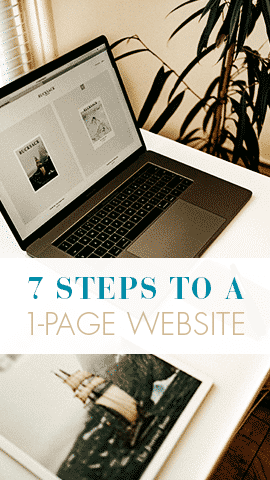 In 7 steps, you can create a 1-page client-attracting website that speaks directly to your ideal clients! Step 1) Call Out Your Target Market. Let your ideal reader know they’re in the right place. Identify your target audience in relatively small text before the headline. This call-out is optional, but I highly recommend it UNLESS your target audience is difficult to sum up quickly. For example, don’t use a call-out like “Women who have trouble sleeping because they’re stressed at work and at home.” That’s way too long and just creates confusion. Keep it simple and direct. “Overworked Women Struggling with Insomnia” works better. Step 2) Get Their Attention with a Strong Headline. Who wouldn’t want to do those things?! Your ideal reader will respond if this headline is written specifically for him or her. SUCCESS TIP: Make sure the language you use on your website is congruent with your message and your brand. You want the message to resonate with your ideal client. Step 3) Push Their Pain Points. To help your message resonate, use a bulleted list of no more than 5 pain points your ideal client is experiencing. Example: “Are any of these true for you? Iʼm stressed out, trying to create a successful business. Marketing my business feels uncomfortable and inauthentic. Iʼm suffering from procrastination and overwhelm, and canʼt shake it. SUCCESS TIP: Remember, people don’t buy transformation. They buy solutions to their problems. By phrasing the bullets in first-person (“I” or “me”), you’ve positioned them so that your reader is more likely to respond if they’ve been feeling those same pains. You’ve established a connection with them by letting them know that you understand where they’re coming from. Step 4) Introduce the Solution. Turn the headline you used on its head, using the key benefits or promise of what you offer. What you’re doing here is showing the ultimate benefit… You’re helping your reader picture what it would be like for them to overcome their pain points and achieve their goal. SUCCESS TIP: For the ultimate solution, think about your clients BEFORE they work with you…. What do they say they want then? THAT’S what will resonate with readers and attract new clients to you. They may experience other transformation in their work with you, but that’s too far from where they are now for them to see. Step 5) Expand the Solution. Use benefit statements that will resonate with your ideal client. • Marketing my business feels easy and authentic! • I feel at ease speaking in front of people. • Iʼm totally comfortable quoting my new higher fees. • My business is organized and running smoothly. Make sure that you have a clear promise… and that it’s communicated on your website. SUCCESS TIP: Keep the bullets in first-person so that your reader can feel the power behind them – the possibility of experiencing that success. Step 6) Develop Credibility with Testimonials. Hearing from others who’ve experienced success means that success is also possible for your reader. It also means that you’ve done this work before and that you’re experienced – instant credibility! Read my post, “5 Tips for Getting Client-Attracting Testimonials,” to learn more. Step 7) Invite Them to Take the First Step. The benefits you’ve laid out for your reader to see and feel are awesome… if they take that first step with you. Don’t forget to include a call-to-action (CTA) so that the reader can take that action right away. SUCCESS TIP: You typically want the CTA to be “above the fold,” which simply means that the reader doesn’t have to scroll down to see it. If you put your free offer in the header of your website, you can always include this CTA near the bottom of the page, too (and you really should). 1. Before you even start writing your web page, be sure you have a great URL and business name. 2. When you’re designing your web page, make the visual congruent with your message. Take time picking out the images, the fonts, and the colors. But don’t get overwhelmed by this step. Your brand is the feeling you want people to walk away with – not colors and fonts. Don’t let aesthetic decisions slow you down. You can purchase the replay for just $7 here!